So a Disney trip is in the books. Amy and I took our two youngest kids to Orlando for the requisite kids trip. After a lot of walking, and a few “discussions” about good food choices, we’ve finished our trek. Now… in full disclosure, it rained on day 3. Regardless, according to Garmin, we covered over 20 miles! Couple of observations- upon realization that a 9 and 11 year old were right there with us, every step of the way, I was increasingly impressed with their resiliency. Kids these days. Also- a lot of people rent those electric carts at Disney, and they probably don’t really need to. Further- they take them every where in the park. Literally. I couldn’t help but think “get up”. It reminded me of the movie “Wall-E” and how people only ride in electric chairs with accompanying movie screens. Have you seen it? It’s a 2008 Disney Pixar film, btw. Now that’s not to say that some folks might need a little help getting around, but others? That’s just an observation. I do think we’re a lot further down the path that the Wall-E movie tried to warn us about, though. Disney is an amazing place and the result of some incredible vision by Walt. He passed away in December of 1966. His “World” didn’t open until 1971. I couldn’t help but ponder how proud Walt would probably be of his almost 50 year old creation. I imagine he’d be pleased with most of his legacy. As a consumer, I would probably offer to Walt that they sure could tone down the profit-taking. I know it’s not a news flash, but Disney has “taking your money” down to a true science. I found myself giddy on the few occasions that I would beat them at their own game. Regardless, no one goes on a Disney trip to see how much money they can save. You know what you’re in for when you sign up. Occasionally, though, it seemed that the profit margin was as important as ensuring that the guest’s experience is even close to magical. Another observation- the employees seemed to be committed to their job, but not really committed to making their guest’s experience “magical”. That was related to me by more than employee. One young lady who claimed she was on “intern” status also confessed that the term was actually just Disney’s way of not paying for college student labor. Interesting… and probably not just a Disney dilemma. One highlight of my trip was a “spin” on the Flowrider. If you haven’t been on one, you should try it. I tried the Flowrider, too. I had more success at flipping on the boogie board than standing. The video of me trying to surf was pretty hilarious. I’ll save it for some other blog post… maybe. It’s worth noting that the other kids waiting in line for the Flowrider were atleast 40 years younger than me. Regardless of the rides, attractions and distractions, a Disney vacation forces a “time out” from life. It helps us remember that our family is special and their love is irreplaceable. Life in 2019, it seems, tends to steal some of that realization from us. I think, ultimately, that’s the kind of magic that Walt truly wanted to perpetuate. I’m going to do my best to take some of that home, Walt. Thanks for the Mickey Mouse t-shirt and for the Pre-Easter vacation. I mentioned that it rained a little but on one of our days in Florida. It wasn’t a total rain-out but we did take some time to go watch the movie Breakthrough. I recommend it, btw. The movie, based on a true story, is about a young man who falls through some ice on a frozen lake. He’s underwater for an extended period of time and ends up in an ICU, without much worldly hope. Through God’s grace (spoiler alert) and a mother’s intercessory prayer, God works a miracle and saves his life. It’s an amazing movie. Amy and I highly recommend it. Breakthrough isn’t a Disney movie and unfortunately Disney doesn’t know much about telling stories about God’s love, but that doesn’t seem to slow movies like this down. I love seeing these amazing stories being told on the big screen. Disney should get on board. Breakthrough– Talk about magical! God’s love never fails! They say you can never delete things from the internet. Regardless, I just did. As you may have heard, we had a little election here in north Georgia. To say it got heated is an understatement. It never needed to be but that’s beside the point. My family and I picked a candidate. The man we voted for and supported has now won. He won by a fairly decent margin, I might add. I’ve already seen one media outlet call it a “landslide”. You may have seen some of my previous comments here. As a result of telling the truth and speaking my mind I’ve had to unnecessarily defend my reputation, too. All as a result of doing what I saw as “the right thing”. It happens. But, that was yesterday. Election Day is over and it’s time to move forward. To that end, I’ve deleted my posts regarding the former State Rep. and this election from my site. Not out of a lack of belief that it was the right and proper thing to do at the time, but out of a genuine interest in living the Golden Rule. Kind of a “that was then, this is now” sort of thing. That having been said, the defeated candidate will probably still have untruths posted about me somewhere on the internet. That doesn’t really matter to me, though. What matters to me is doing my best, being honest and then moving on to better things, better stories and better days. As we say in the flying business when a procedure is completed: “Check”. So… if you voted in this election, thanks, regardless of who you voted for. Personally, I believe the best man won. I’m in good company, too because that guy received 75% of the vote. Now, the best man can finally get to work. Let’s clean up the confetti and move on. There’s a lot of good life to live here in the 28th District! Have a great day! As a USAF ROTC cadet at the University of Georgia, we were required to learn a poem called “High Flight”. It was written by John Gillespie Magee, jr.
At the time, I knew nothing about Magee, and didn’t really hold much credence for his poem, either. All I knew was that I had to be able to recite it, start to finish, on command. I did, and I can still repeat every word to this very day. Difference is, after 35 years of flying airplanes, the words have quite a bit more meaning to me now. It turns out that Magee was the son of missionaries and was born in China. He grew up in England and joined the Royal Air Force at the beginning of WWII. He was a fighter pilot and knew the true glory of flight. He died in combat in December of 1941. I didn’t know why I needed to memorize that poem back in 1984. I now know that there are times that I appreciate the words more than I could have ever dreamt. Most people don’t know the glory of flight. No offense to those of you that don’t… but sometimes I feel like that explains a lot. Several weeks ago I noticed that a good friend of mine looked like he was losing weight. I asked him how he had done it and his response was something generic. He quickly added that he felt great and he would tell me about it sometime. I saw him again a few days later and asked again. I told him that I could afford to lose a few pounds, too, (I was at 238) and that I’d love to know what he was doing. This time he responded that the program was called “Optavia” and he would be glad to sit down and tell me about it. As it turns out, Optavia has been helping people create “Healthy Habits” for a long time. The leadership of the program comes from Board certified physicians and dieticians, including Johns Hopkins University Docs. Not being one to do much of anything halfway, I was all in from day one. I’ll quickly add that’s it’s been a very good journey from the beginning. I’ve lost 21 pounds in 5 weeks (not kidding) and I have atleast 7 more pounds to go. I’m wearing size 34 pants and have dropped off all of my 36 and 38 size pants at our local Goodwill. That’s a great feeling, by the way! I’m currently at 217. I haven’t had a size 34 waist or been below 220 since I was a Captain in the USAF (and that was a long time ago). I have been so impressed with how well Optavia has worked for me that I’ve now signed up to be an Optavia “Coach”. Nobody really wants to hear about somebody else’s diet, so I’ll just leave it at that. I’m having a blast while getting more healthy, though. If you think you might want to give it a shot, check out my Optavia Coach’s page and let me know if I can help! … I thought it might be nice to do a re-post on a blog entry I did at this time last year… Enjoy… and Never Forget. I called Lee Ielpi today, just like I’ve done for the better part of a decade. I can’t really remember how I first met Lee… but his story is one you’ll never forget. Lee Ielpi is a quiet hero. He knows heartache and tragedy better than most. He’s witnessed the unimaginable with his own eyes. Through it all he has helped maintain the real and relevant part of the 9/11 story while also remaining one of the most solid and squared away individuals I know. If you happened to be in the area of southern Manhattan today, chances are you’d make it a point to visit the 9/11 Memorial. Some call it “Ground Zero”. The Memorial does an incredible, albeit sobering, job of telling what happened at 1 World Trade Center on that day. The Memorial is as much a museum as it is a Memorial. As you descend under the rebuilt streets of Manhattan you’re gradually surrounded by the sights, sounds and even smells of our generation’s day that will live in infamy. You begin to hear the voices of firefighters calling for more support equipment. You hear New York Police Department officers requesting backup and emergency equipment. Knowing the final result, you begin to ponder how strong their commitment was to their mission. You consider how heartbroken they must have been when their initial efforts to save lives and property would seem to have been in vain… for whatever period of time that realization may have been. As you delve further into the Memorial, you witness some of the scenes and voices of tragedy as people, innocent victims, in the Twin Towers begin to realize their fate. In and amongst the voices are steel beams that appear to have been twisted like spaghetti as the building fell. There are fire trucks, crushed almost beyond recognition, which were left abandoned by teams of lifesavers who were never able to return to the place where the trucks were parked. If you’re like me, when you visit the 9/11 Memorial, it’s about that point in the “tour” that you begin to remind yourself that this was an event which occurred a long time ago. It becomes a little too overwhelming and you want to remind yourself you can walk away. You remember, almost like waking up from a bad dream, that the scenes you’re seeing and voices you’re hearing are from a bygone era, envisioned and enacted by very evil individuals. You remember that you’ll walk out the door of the Memorial in a few minutes, probably with a tear in your eye, hopefully into a glorious Manhattan afternoon… and you may even begin to ponder where your evening meal might be. You’d remind yourself of your Freedom. For Lee Ielpi, and many others like him, the nightmare of 9/11 can’t be left behind by simply walking out the doors of the Memorial, however. Jonathan Ielpi was in the middle of a shift on the morning of 9/11/2001. 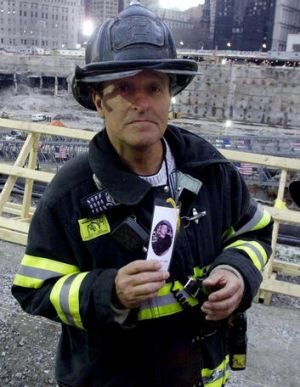 He was a Firefighter in Squad 288 of the FDNY Special Operations Command located in Queens, NY. Major incidents and Hazardous Material events were their specialty. Jonathan and Squad 288 were the tip of the spear for the FDNY and people of NYC. From l. to r.: Brendan Ielpi, Lee Ielpi, Jonathan Ielpi and Jonathan’s two boys Andrew (in front) and Austin (held by Jonathan). Chances are Jonathan heard the Boeing 757 come in low over southern Manhattan, as most everyone in New York City did that day. When the call came in to Squad 288 the report was that a twin engine aircraft had flown into the World Trade Center. Jonathan suited up. He and his team knew there was work to be done. I’m sure the scene, on that crisp and clear September morning, looking up at the Twin Towers, must have been more than Jonathan could fathom. Regardless, Squad 288 launched into action without hesitation and hurled themselves into the melee before them. Then, at 9:59, the South tower fell. We can only speculate if any of the team members had any idea of the magnitude of the situation. There are survivors who can tell the story, but a total of 9 lives were lost on 9/11 from Squad 288 alone. No one could have imagined the towers would actually fall. The unimaginable day just got inifinitely worse. If you’ve seen any of the videos of the aftermath of the towers falling, you’ve experienced some part of the deafening silence that enveloped the area afterwards. You may have also noticed the continuous chirps that sounded from beyond the haze and remnants of paper that swirled in the air. Each of those chirps was a firefighter’s alarm that automatically goes off when the firefighter doesn’t move for a brief period of time. One of those chirps was the alarm that had been connected to Jonathan’s tank and equipment. 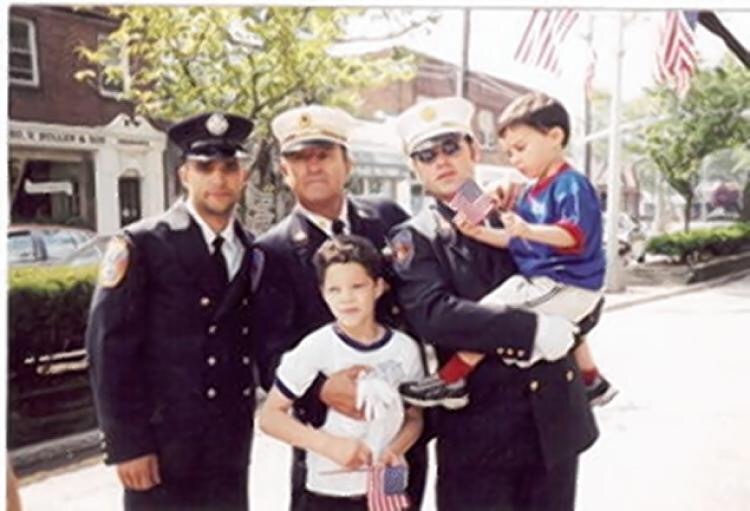 Lee Ielpi, who was in the waning years of his firefighting service on September 11th, rolled onto the scene, in a support role, about 30 minutes after the second tower had fallen. It was no longer his job to drag hose and don the turnout gear. Those jobs were for the kids in the service. The kids like his son Jonathan. As any Dad would do, and as the reality of the situation began to set in, Lee began to wonder about Jonathan’s location. Ofcourse it wasn’t a time to lose focus on the task at hand, but Lee began to worry. As a result of his years of experience, he quickly realized that things may quickly get untenable. Only moments later he was told Jonathan was gone. When you meet Lee Ielpi today, he’s a face of peace and contentment. When I spoke to him today, he thanked me for the call. We asked each other about family and shared a tear for loved ones gone home. He reminded me that he was now a Florida resident and that I needed to come visit. And, as he always does, he invited me to come to The 9/11 Tribute Center sometime soon. The Tribute Center is across the street from the 9/11 Memorial. It’s a private effort and is supported by selfless giving. The Tribute Center is Lee’s tribute to his fallen son, and many other families who have stories similar to the Ielpi family’s. As we chatted, Lee mentioned, with a smile “in his voice” that the Center had recently expanded to over 3 times its original size. He said they had officially changed the name and now referred to it as a museum. You can find out more about Lee Ielpi’s vision which became a reality here. 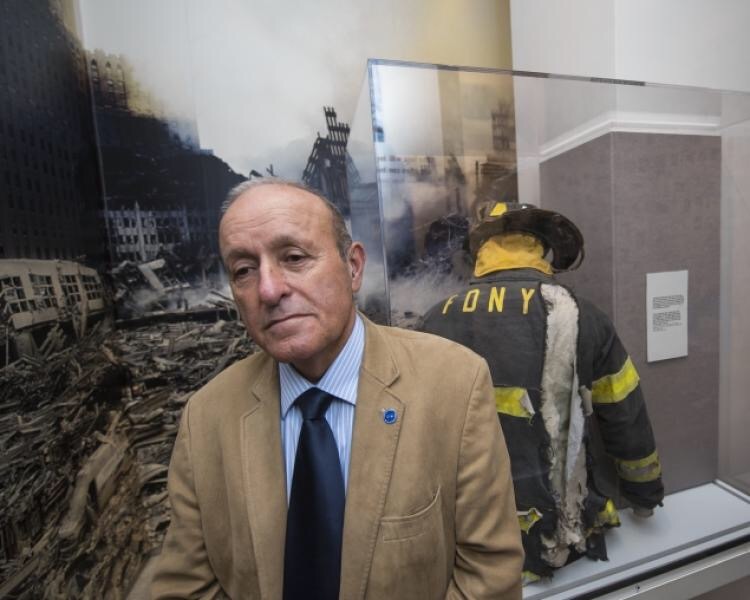 As was Lee’s vision, many years ago, on any given day, in and amongst the throngs of people venturing into the 9/11 Memorial, you can find the Tribute Center open, eagerly welcoming visitors to come in and hear “the rest of the story” firsthand. The Tribute Center does not employ many people. Most of the people you find there are volunteers. They’re not just any volunteers, either. At Lee’s behest, if you want to volunteer there, you must have had some direct impact to you or your Family on 9/11. You’ll only find family members or First Responders there volunteering. They help to finish telling the story of what happened, to them, on September 11, 2001. The Mission of the Tribute Center is to honor and remember the lives lost on that day. No one can help us remember better than those who felt it, saw it and were impacted by it themselves. The Tribute Center is the true personal side of 9/11. And with that… I’ll wrap up my post. It’s one of heartache but happiness. You hear both when you talk to Lee. It’s easy for the rest of us to say we’ll never forget. Lee doesn’t have a choice and yet he knows he’s blessed and won’t hesitate to tell you that. His therapy is honoring those who did NOT die in vain in the first battle of the War on Terror… and what a therapist he is for the rest of the world. If you’re lucky you can catch Lee at the Tribute Center sometime soon. If you don’t find Lee, you can still find plenty of other volunteers willing to share their stories. You can also see Jonathan’s turnout gear, just the way it was found, months after 9/11/2001, lovingly displayed as only a father can do. Let us always remember. Let us never forget. This is what it looked like as we visited Calafell, Spain with Bucky Kennedy and his family. We traveled to Spain to talk to kids about Jesus. We barely spoke their language, we hardly knew a thing about them, but, by the end of week, over 30 of the 200 we spent time with came to know Jesus. In case you haven’t been to Spain lately, I imagine it’s a vastly different place than the Spain that funded Christopher Columbus’s expedition to the “New World” in 1492. Its exposure to 21st Century cultural issues seems to have been expedited much more so than even ours has been here in the US. Their society is definitely European and it strikes me that, generally, they want to blend in, rather than maintain a specific heritage. The monetary system is based on the Euro. Their culture seems to have been “blended” into one of cultural diversity. Kids and teenagers are exposed to issues, any and all, that have traditionally been reserved for more mature adult minds. Poverty is broad, yet opportunity still exists for those who acquiesce to social norms. My pastor asked if I thought Spain could be qualified as a “Post-Christian” society and I responded that I could see that as a reasonable perspective. All that being said, my family and I were eager to arrive in Spain, along with Bucky Kennedy and his family. As we settled into a summer camp routine of singing, devotionals, small groups and getting to know others who were there and assisting like we were, we began to see kids who were thirsty for “what else” this life has to offer and what purpose they could fulfill. As I spent time with these kids, I heard stories of other kids, their friends, who didn’t seem to know, or care, about God. I heard about kids who had many, many distractions and whose attention was easily turned away from the Bible and Jesus. When he spoke, Bucky had a translator. Juan Marcos had the monumental task of translating “North Georgian” English into Espanol. I told Juan Marcos I’d be praying for him before Bucky’s first speaking opportunity. On that occasion, Juan Marcos had to inform Bucky that there was no translation for the term “squashing a bug”. Regardless, Juan Marcos stuck with Bucky all week and did an incredible job. Now don’t be fooled, we had free time. Serving “On Mission” in a First World country, bordered on the south by the Mediterranean Sea, isn’t especially difficult. Regardless, we had plenty of time to share the love of Jesus with the kids at camp, and we took advantage of that at every opportunity. It was probably on the third night in Calafell, at camp, that it hit me. As much as I might have set out to do my best to tell a few kids from Spain, Portugal, Italy and other countries about Jesus, they were blessing me even more. There was that song… I knew the words in my language… but I knew only some of the words in theirs. By the third night, the kids knew all the words. Regardless of all the stuff, the “cosas” they had to deal with in their world, they were singing. Regardless of the questions they had asked me, they were singing. Regardless of the poverty some of them had told me about, they were singing. Regardless of the questions and distractions, and how fast their society wanted them to deal with adult issues that they aren’t prepared for, they were singing… and smiling… and what a blessing it was. God is good and His plan is perfect. That is what I believe. I’m not perfect, far from it, but God is opening my eyes a little more all the time, and what a blessing it is. My family and I will continue to pray for the kids we spent a week with in Calafell, Spain. We’ll pray they now know, or will continue to grow in, the love of Jesus. Our prayers will be that they bless others and share the love we have shared for and with them. We’ll pray that Spain, and all of the other countries that were represented at camp, will soon become a “Modern-Christian” society (if that’s a thing) once again. We’ll pray that, because, life with the God we know is a blessing in this world and His gift of Heaven is worth everything we can give… and then some. Now that we’re home I realize that He just reminded us of that, and blessed us, yet again. Amy and I just had the amazing opportunity to spend the weekend at Half Mile Farm, one of the properties of the Old Edwards Inn, in Highlands, NC. In short- What a blessing. You need to go! First of all- I prefer rustic over fancy. My standards aren’t impossibly out of reach when it comes to being comfortable. On the other hand, I know a unique and special place when I find it. This place is definitely all of the above. The Farm sits on 14 acres, complete with fishing pond, called Apple Lake (poles provided), walking trails to walk off the carbs from the chef prepared quiche breakfast and tree frogs that seem to start on cue around sunset. The Farm claims to be a Bed and Breakfast style Inn, but it’s truly much more than that. With a recently completed bar and hors d’ouvres at sunset, you’ll quickly find that it’s nothing short of ideal. Believe me, I wouldn’t want to be on their bad list! For those that wouldn’t mind spending an extra nickel (my Dad always said that for a nickel more you can go first class) then The Farm has several incredible cabins that are only a short walk down the hill. The second you walk in the door of any of the cabins, you’ll know you’re stepping back in time while still having access to all the creature comforts of a 21st Century home. The barn wood that was used to build the cabins was actually taken from locations all over the southeast. The cabin building project was started back in 2004 and it took over two years to complete them all. The effort was masterminded by several different entities who put a masterful touch on the property. Ronny Bolton, a Real Estate Developer from Aiken, SC, Todd Blair of Atlanta and David Grant Howard, President and Founder of Historic Lumber in Greenville, TN all came together for the project. The Team’s vision is evident in their successful result of a perfect blend of nature and history. Mixed among the rhododendrons and hemlocks are the historic and rustic cabins that, if they could talk, would tell stories of families and frontiers from early 19th Century Mountain living. It’s apparent through their study of the history of the buildings that their commitment to reconstructing, while not re-shaping, history was of prime interest. To say that Half Mile Farm is a special place is an understatement. Its ideal mix of history, nature, service and comfort is truly immeasurable. If you can find an open weekend, and if they have an extra room (or cabin), you should go. I hope to see you there soon! It’s time to Build for Devon! It’s been a little while since I’ve slowed down to pass along a few thoughts. Regardless, Life rolls on, and blessings have been happening every day! UGA will also have announcements and pictures for Devon on the big screen during the G Day game, as well. Bottom line- we need your help. Please please please consider helping us build a house for Devon. Whatever you’re doing right now- stop and take a minute to make a difference. The Gales deserve the help, it’s honestly a blessing to know them, and Devon, who has smiled through the adversity, would be blessed with suitable housing to help him prepare for his next chapter in life. So this is what Glory is like. It’s early in the morning, January 2, 2018. The golden sun has yet to rise above the San Gabriel mountains to pour its orange glow onto the streets of Pasadena, Beverly Hills, Santa Monica or Orange County, California. Regardless, Georgians all over the country, and tens of thousands in California, are waking up, asking if it was real… and rejoicing that it was. The Dawgs have won the Rose Bowl. Pinch… yep, it’s real. I attended the University of Georgia. I was fortunate (in several ways) to graduate, in 1988, after 4 years in Athens. I then received a “slot” for pilot training and a Commission in the United States Air Force. What a blessing that time was. When I started at UGA in 1984 some of the glory days had just occurred. I had just missed it, but the glory could still be felt on campus, and surely, we thought, there was more glory soon to come. Herschel Walker was still on campus during my time at UGA. He wasn’t playing college football by then, however. I chatted with him a couple of times as we walked to class. I was in awe and he was gracious and friendly enough to spend some time talking with a lowly freshman. It’s a little known fact that Herschel went back to Georgia to finish his degree. He traded the thunder and glory of Sanford Stadium for the peace and quiet of the majestic oaks of Old College. Not necessarily by choice, mind you, but definitely out of an obligation and commitment to finish what he had started. Just like Coach Dooley had wanted. Gone were the “Walker, My Dawg” t-shirts from just a few years before and “Life after Glory” had begun to set in. He was back on Athens keeping a promise made. All because he was, and is, a Damn Good Dawg. On a side note- the Savannah Historical Society has Coach Dooley’s day planner from the late 70s. If you go visit, you’ll see it opened to a page, quite appropriately, where the Coach had scribbled “go to Wrightsville to meet the Walker family” or something to that affect. What a visit that must have been. Glory. But… All of that was a long time ago. So, needless to say, it’s been a long road back to glory for Georgia and our Dawgs. Dooley, Goff, Donnan, Richt. They’ve all coached from the heart and out of a commitment to the school they love. There’s no question about that. They all had varying levels of success, however, and none have ever seemed to reach the level of the Modern Era UGA Glory of the early 80s. As a result, those of us who cheer our alma mater have had varying levels of frustration, over the last 35 (plus) years, as we have pined for Glory, once again. But College Football is big business. Really big. It’s not about heart or love, right? It’s all about going through the motions and showing up on time for the ESPN interview, right? Wrong. So wrong. I get it that coaches and staff have to move around and that sometimes their allegiances need to shift like the gears on the buses running the North-South route on campus. I get it that team chemistry is something that can’t be calculated or, many times, duplicated. I get it that sometimes a recruiting year is good… and sometimes not. I get it. But, when it’s all said and done, I truly believe that team, sports, football, chemistry, etc is as much about Home and Roots and “Raisin'” and Staying Grounded in Faith and doing things for others rather than yourself as it is about business, allegiance to a job and just showing up on time. And that’s what seems to be different about the 2017 version of the University of Georgia football team, its Coaches and its staff. Glory, Glory. I’ve watched a lot of UGA football but I never played in college. I know I’m not alone in being a Grandstand Coach and that there are plenty of legends who are much more knowledgeable of the game than me. I also don’t know all of the coaches and players… but I know a few, and I’ve watched them grow as the games have unfolded. As a result, I feel like I know the heart and commitment that the team and staff have. The selfless commitment to others. The commitment to integrity. The commitment to chopping wood. The commitment to winning. The commitment to Attacking the Day. The commitment to Throwdown Thursday. It’s all of that which makes it fun to have watched this season unfold. I’ll admit that over the years I’ve grown used to us beating ourselves. I’ve grown used to conservative calls on third and long… or even 1st and ten for that matter. I’ll even admit to resigning myself to some of that old-time defeatism as our Dawgs fought through the first half of the 2018 Rose Bowl. But then… Glory. This year’s team, it seems, has turned a corner. You could try to point to a person that brought about that new direction… maybe he wears a visor. Maybe he wears a certain number. Maybe it’s even a few people who you could argue have made that happen. I’d submit, however, that it takes more than that. Much more. One, two or three people can’t change a mindset. It takes buy-in for that to happen. It takes “want to” from the rest of the team to get to the National Championship game. It takes talent committed to excellence to compete against a team that “beat the dog crap” out of you only a few weeks before. It takes a fan base thirsty for just a little more, willing to travel to South Bend or even cross country, by any and all means available, in hopes of catching a glimpse… or maybe even being a part of that thing… called Glory. And then, when you see it, you grab it… fleeting as it is… and you revel in the moment. And you wake up pinching yourself. So here we are. On the threshold of a National Championship game. And we’re in it. It brings tears to my eyes to even type it. Glory. It’s everything people talk about in sports. It’s right before our eyes. It’s on the backs of jerseys with the letters Chubb, Michel, Eason, Cleveland, Blankenship, Fromm, Swift, Wims, L. Carter, that other guy, the one with the visor , and so many, many more. Each name with its own story on this path. Knowing that those names have created a bond, between themselves, a bond that will last a lifetime. A bond that only combat veterans and Championship sports teams can truly relate to. The bond that only comes from self-sacrifice and commitment to excellence. It’s knowing that those names will be talked about for a long, long time. They’ll be typed into record books and emblazoned in bronze. Regardless of what happens on January 8th, 2018, what has happened already is legendary. Now please don’t misunderstand me. I realize that many people, inside and outside of Georgia, could care less about Georgia football. I also realize that there are pressing issues in the world that need “fixin'”. Regardless, this is timeless to many. Many that I know and many that I call friend. It very possibly may be a “once in a lifetime” thing. I certainly hope not… but, who knows! Glory is all around us. It is, I believe, ahead, as well. Life, in some of its most mundane forms, can go on a week from today. For now, however, the Glory unfolding before our eyes is truly a sight to behold. It makes us smile… it’s a tie that binds. It’s success, focused like a laser and in its purest form. Seeing victory and success is life at its best. And when it’s your Alma Mater, it’s truly inexplicable. Go, Dawgs. On to Glory.